Five years after its destruction, a hospital has reopened its doors in the heart of a port city. The Ishinomaki Municipal Hospital located in the district of Minamihama suffered severe damage during the earthquake of 2011. Almost completely destroyed, it was rebuilt near the station, 2km from the sea, and its reopening was celebrated on September 1st. Working closely with the Ishinomaki Red Cross Centre, which plays an important role in the region, the new municipal hospital wants to be worthy of being called “a hospital for all citizens”. It had to be content with a relatively small number of patients — just 34 — on its first day. But the municipality is confident about the future, anticipating a daily average of 199 visits. Before the earthquake, the hospital was in financial difficulty, so it was imperative to start operating more efficiently. The former municipal hospital was first opened in Minamihama, close to the sea, in January 1995. It lay directly in the path of the the tsunami on 11th March, 2011. That day, 480 people — staff and patients — were in the hospital. As instructed, staff had immediately moved the patients from the ground floor to the top floor. None of the patients died, but four staff members were killed, including two casual workers on the ground floor. The flood water also swept away the backup electric generator, all means of communication and all the reserve stores; the hospital found itself completely cut off from the outside world. It took two days for the building to be completely evacuated. Despite a totally non-functioning building overflowing with numerous sick and wounded people, the hospital had to provide medical care for the entire area around Ishinomaki. A month later, an emergency hospital centre opened in another location. 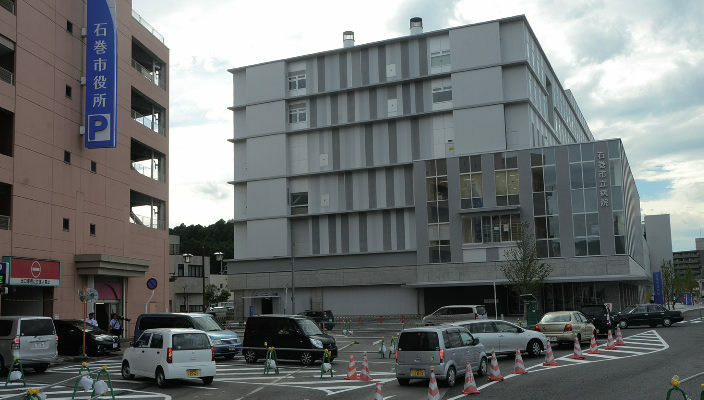 On May 31st 2012, the hospital was moved to the Kaisei district where temporary housing had been set up. The Ishinomaki Red Cross hospital, the only large hospital with an extensive bed capacity serving both the regions of Sanriku and Ishinomaki before the disaster, became even more important after the earthquake. In addition, the problem of an ageing population forced the municipality to rethink its hospital provision. Since then, the reopening of the hospital has been a top priority. So that the new hospital could function adequately in the event of another natural disaster, it was decided to rebuild it close to the station, next to the town hall. Work began in October 2014, and was completed by the end of June 2016. Part of the new hospital is seven floors high. As the neighbourhood is at risk of flooding in the wake of another tsunami, consulting rooms and wards were put on the upper floors, and the building had to meet all the new earthquake regulations. The cost of construction has risen to 13.7 billion yen (about 119 million euros), almost double the initial budget. The new hospital provides only six specialistwards, rather than thirteen previously: internal medicine, surgery, orthopaedics, radiology, anaesthetics, and rehab. Although the range of services is less extensive, the hospital has doubled in size to 23,920m2. This is due in particular to the introduction of a palliative care service, the first in the region of Ishinomaki. As well as admitting medical emergencies and caring for recuperating patients, the hospital is responding to the municipality’s ambition to provide medical services for the entire region. Because the district around the station was flooded in the tsunami, the car parking area was built on the ground floor of the hospital. On the first floor, in the the reception area, there’s a piano, a gift from the American singer Cyndi Lauper. In March 2012, during her visit to a music shop in Ishinomaki, the American pop star bought a piano that had been destroyed in the tsunami, and asked for it to be repaired. She donated it to the city “for its people to enjoy it and restore their spirits through music”. Since then, the piano has become the emblem of the hospital. At the reopening ceremony, the city’s mayor, Hiroshi Kameyama, spoke on behalf of the founders of the hospital. “The reopening and relocation of the hospital have been made possible thanks to countless helpers and the warm support of many people. This is a big step towards restoring medical care throughout the whole of our region. This hospital will be one of the foundations upon which our citizens can build a tranquil life.” The hospital director, Hideo Ise, recalled the progress of its reconstruction following the earthquake. After having maintained the provision of care in temporary facilities, he now wishes “to provide care tailored to each patient, with both specialist medical personnel and nonmedical staff.”.